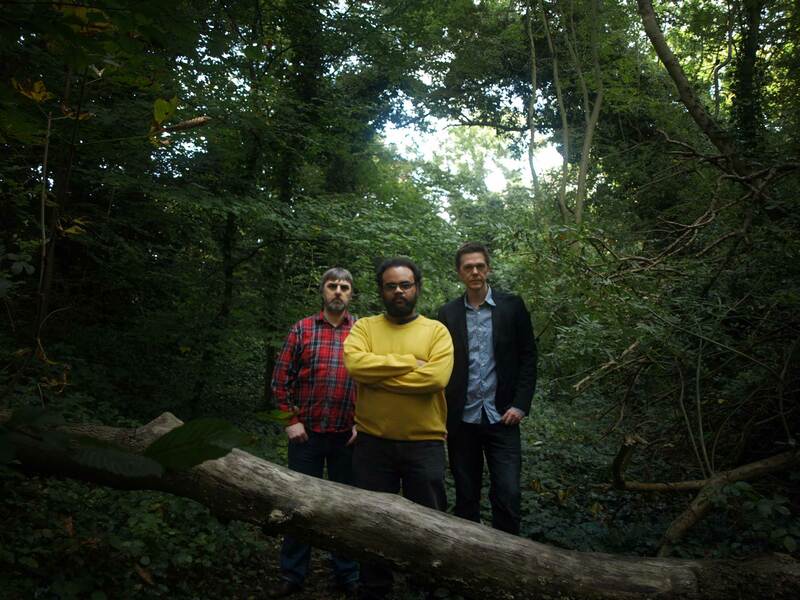 We meet the London-based band The Sighs of Monsters (l-r Brett Lock, Dean Sobers & Chris Houston) and fling some questions in their direction about the band and their new album, Ground. We formed in the late summer of 2013. Brett and Chris had been building up their home studio for another musical project, and when that ended Brett turned to his file of unrecorded or unsatisfactorily recorded songs from his previous bands. The trouble was, neither of them was a singer so they needed to find one who could do justice to the deeply personal lyrics. They met Dean through a mutual friend and were impressed by his collection of recordings called “Picking At Scabs” which suggested a kindred spirit. When the three of us got together the chemistry was immediate. It’s the obvious question, but there is no obvious answer. We suppose the easy answer is ‘art rock’, but in truth we do what we think the song needs. Three quarters of a century into rock ‘n’ roll, the musical vocabulary is so huge that restricting oneself to a particular style seems pointless and needless. The ‘The Sighs of Monsters’ sound comes from the way we play and the personality of Dean’s voice, but we don’t mind pulling in elements of folk, jazz, punk, ska, avant garde, or straight-down-the line rock. There comes a point in the life of a song where it is almost able to tell you what it needs. The trick is to listen. We feel we’re more influenced by an artist than by their art. What we mean is that the way an artist approaches making art is often more instructive—from a creator’s point of view—than the resulting art. We like artists and bands who are thoughtful about the process of writing music, crafting songs and making albums. We’ve established that we all like Neil Young and we all like Grunge (Nirvana and Smashing Pumpkins, in particular). Dean really likes Sparks, Brett will listen to anything by the Velvet Underground alumni, while Chris enjoys Krautrock and Electronica. But the main thing is to keep an open mind: Dixieland Jazz and Country & Western have lots to offer, as do Death Metal and Hip Hop. How did you approach recording ‘Ground’? We started recording with no fixed agenda. This is the freedom that having the run of a home studio affords you. We recorded far more tracks than appear on the album, but there came a point where this group of songs started feeling like they belonged together and formed a satisfying whole, so we focused our attention on finishing them first. We knew from the start that we wanted to create an album that felt like one of those classic albums we grew up with. The ‘album’ as an artistic statement has lost a lot of ground over the last decade because iTunes culture has emphasised random individual tracks compiled into personal playlists. We wanted to create something for the type of music fan that enjoys sitting back and listening to an album as a cohesive work: someone with patience and who remembers why they loved music. What were the practical considerations in pursuing this ‘classic album’ objective? Well, the chief thing was to acknowledge what shape and form albums took. We’ve mentioned the damage that single-track downloading has done to the art form, but of course the other technological development eroding it was the CD format itself, allowing almost 80 minutes of music per disc. Bands felt they needed to use this space, but they really shouldn’t have. People seem hard-wired with an attention span of about 45 minutes, so we were determined the album would not exceed that. In the end it came in at just over 42 minutes. There’s an imagined break in the middle too, which is perfect for pausing to pour another drink. Were all the songs previously written? Oh, no. Though the original impulse was to record songs we’d all had lying around, the more we played together, the more we realised we had something special. The creative energy this produced got us all writing again, so some older songs were rewritten from the ground up and several more are completely new. Having said that, while fans of our respective previous bands might recognise a line here or a hook there, even those ingredients have been cooked up in a new way. You’re quite vague about who plays what in the band. We are, but for good reason. While we naturally have our strengths on particular instruments when playing live, in the studio setting we’re more relaxed and experimental about who plays what. While we generally play everything ourselves, Brett Collings, an old band mate of Brett’s did some drums for us and our friend David Toube contributed a guitar part on one track. On Rosemary Parts I & II, we hired a session player called Ian East, who was fantastic, to do the saxophone parts. Some of your percussion sounds are quite inventive. We compensated for not having a full time drummer by creating percussion parts by sampling anything from toys and kitchen implements to antique drums we found in a junk shop. These we treated digitally in various ways and constructed parts through editing and altering these sounds. It was very much a case of using the studio as an instrument, as we’ve said before. Are you more of a studio band then? Well, yes and no. Yes in the sense that we use the studio as a creative environment and craft our songs with a cavalier disregard for how we’ll perform them on stage. We feel this is an acknowledgement that popular music’s “great leap forward” was achieved when The Beatles stopped worrying about writing songs for two guitars, bass and drums and settled in to Abbey Road. In the US, of course, the Beach Boys had a similar epiphany when Brian Wilson stopped touring and instead used the studio as a creative tool in itself. 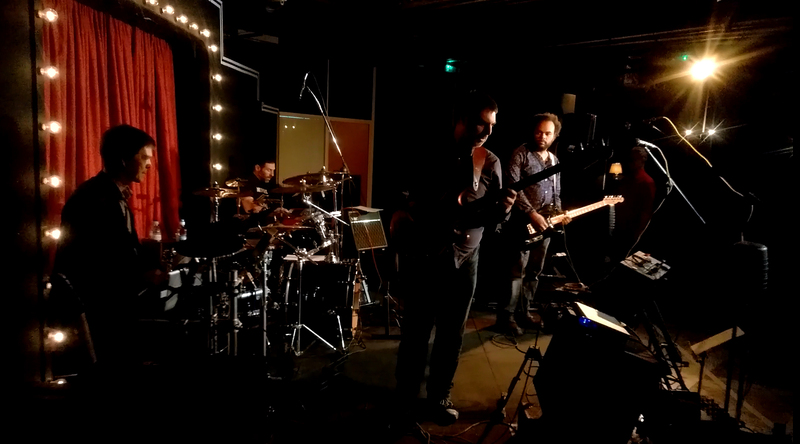 That said, nothing beats the rush of performing for people, so we’re now working hard on live arrangements of the songs. So The Beatles are a template then? Haha. No. Brett is a huge fan while Dean remains indifferent, but it is funny you ask because our drummer friend reviewed an early cut of the album and remarked that it had that “Beatles thing” with the songwriting. Now obviously we’re not so delusional as to think we ought to be compared to The Beatles, but what he meant is that Dean generally writes Macca-style third person narrative songs while Brett’s are more Lennony first-person confessional. Meanwhile Chris is ready to throw in a Harrisonesque curveball. This was a lucky accident, but fitted perfectly with our mission to create something approximating a record from the golden age of ‘the album’. Has working in your own studio made a difference? Oh undoubtedly! The thing is, the way records are made has changed considerably because of the shift in the culture of musical consumption, both the challenges and opportunities of the Internet, and the current crisis in the music business, and—most importantly—the new technology. It is quite literally possible these days to have as much power in your spare bedroom as they had during the heyday of Abbey Road or The Hit Factory. Almost everything is software-based these days meaning not only is it affordable but it doesn’t disturb the neighbours. Exactly. We think that this is the way albums will be made in the future. We all have other jobs because the reality is few can afford to pay the rent as a gigging musician these days. So it is important both that we have studio access when and as we need it and that we’re not paying by the hour. Increasingly new music is being made by self-starting enthusiasts who invest in the gear and put in the time at every opportunity to produce a ‘labour of love’. Frankly, this is the only way great music can now be created. The margins are so tight as the industry is squeezed that the ‘formal sector’ is dominated by narrow commercial interests designed to be easily consumed and disposed of, or by long-established artists who made it under the old regime and still have the resources to keep going as normal. But for emerging artists, this is the way forward if you want the creative space and freedom to work on something not destined to be a ringtone. And, once you have these tools, working is a joy. Have you started thinking about a follow-up to ‘Ground’? Yes indeed, but we’ve had to restrain ourselves. We had so much energy coming off this album that we have practically planned the next two! But we know the immediate task is to promote this album and to get the live show together, so we have to calm down a little on that score. We look forward to resuming work on new material in the Spring next year. Until then, we’ll just be doing our best to make sure we can persuade as many people as possible to listen to Ground, because we really believe it is something special. Let’s hope it finds its audience! Thank you! It is hard to know what to do with it given the state the music industry is in at the moment. Artists are increasingly at sea, left to do their own public relations and marketing. This opens up a lot of opportunities that might not previously have been there when almighty record companies were the ultimate gate keepers, but at the same time marketing and PR isn’t necessarily what artists do best. Sometimes we feel like small time crooks who, through a twist of fate, have stumbled upon the haul of the centuryÃ– but have no idea how to fence it. We’d love nothing more than someone stepping in and offering to take it off our hands! 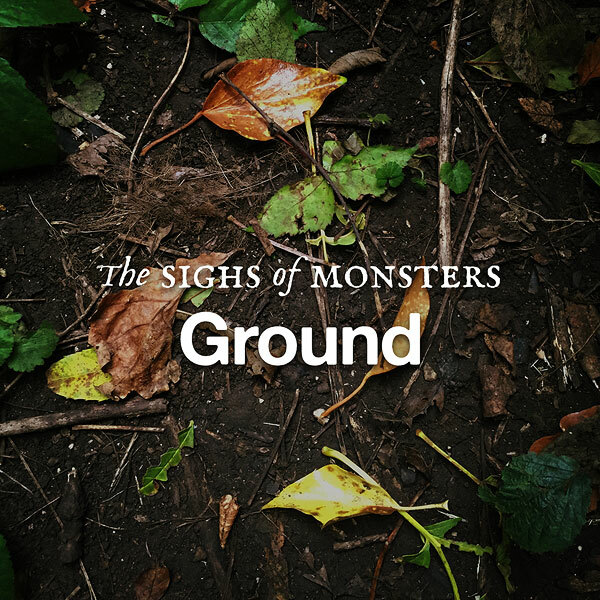 Ground by The Sighs of Monsters is out now on CD and Download. The epic swords-and-sandals official film for ‘The Engagement’. We cut the video from public domain footage from Il Gladiatore Invincibile, a 1961 Italian/Spanish film directed by Alberto De Martino and Antonio Momplet. It was the perfect metaphor. We filmed some appropriately eerie ‘through the undergrowth’ footage as a backdrop to our lyrics video for The Sonneberg Summerhouse in a woodland park in South East London.